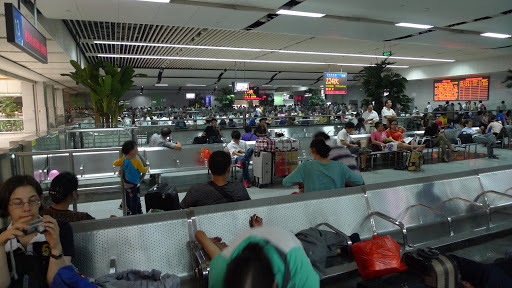 Shenzen to Yangshuo. Finally in transit! 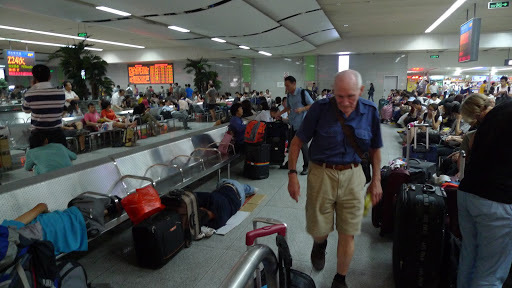 Now that we’ve moved on from toilet discussions we can start to get right into our life in China. 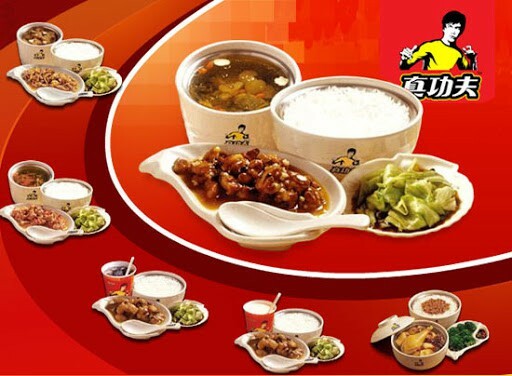 While we waited for our overnight train at Shenzen station, Jing took us all to a Chinese fast food chain called “Kungfu”. We really should have followed Jimmy’s lead and headed to the adjoining McDonalds (can’t believe I would ever say that). 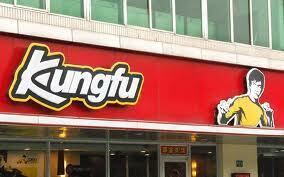 Kungfu was pretty ordinary and left us wondering about what kind of food we might expect for the rest of the trip (concerns unfounded by the way, the food in China was awesome, but more on that later). There were no other food options at the station so we all just made do while we waited the couple of hours for the train. Finally the moment arrived for us to go to the first “holding bay”. Once the announcement was made to board the train a massive herd of people moved through the gates towards the escalator down to the platform. There was also a set of stairs but because we all carried luggage we chose the escalator. About 5 seconds into the descent there was pandemonium when a woman getting off the escalator at the platform must have tripped or stopped or something, I have no idea really what happened, other than the escalator continued down with dozens of people just piling up over each other, unable to get off the thing. It was like in a horror movie. I didn’t know what to do. I turned around to Sam behind me and his expression really showed how he was feeling. Terror. Dave was a bit ahead of us and could see what was happening. He says that he was ready to jump off and just grab us and drag us off. Fortunately he didn’t have to do that. Amongst all the screaming and shouting a guard had managed to hit the emergency stop button. The human debris at the bottom was cleared in a couple of minutes with no apparent injuries, and we all then made our way down safe and sound. None of our group was affected but it really shook us all up, and from then on whenever there was a choice to go down escalators or stairs, we always took the stairs. And so to our accommodation for the next 14 hours or so. 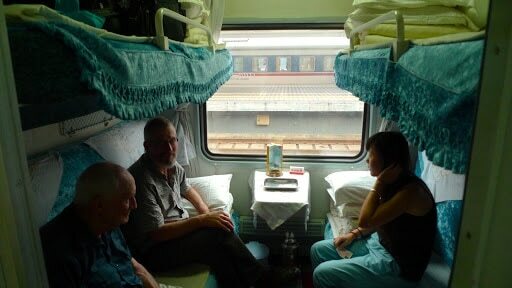 Dave & I would be on the top bunks, with Sam and an as yet unknown random Chinese citizen on the bottom bunks. 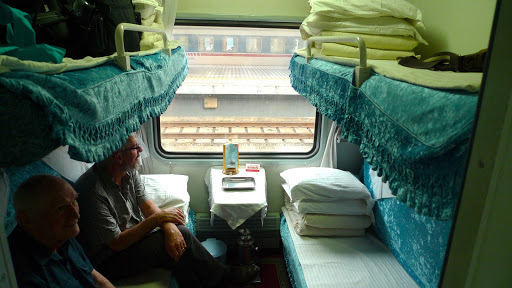 The way the trains work in China is they actually fill the beds rather than being able to book a sleeper to yourself. So there is always the chance to have a stranger in the room. This didn’t faze us too much but as it turned out we had the room all to ourselves as our roomie never turned up. That’s Dave and Sam, with Jing coming in for a chat. The beds are hard, just like lying on plywood with a thin blanket on top. The cabin was clean, but I just couldn’t tell about the bed linen…. There is a hot water urn at one end of each carriage and the happy room at the other end. Bonus – there was a western loo! I really did enjoy this train experience. We spent much of the night enjoying the company of the mixed dozen and getting to know each other. And then it was nightie night time (to quote Jing) which wasn’t as bad as expected. All I did was wear an eye mask, lay straight on my back and practice Yogic breathing. 7 hours later I woke feeling pretty darn good. Sam mentioned getting very little sleep and Dave said he slept well. The rest of the mob reported various states of sleeplessness and comfort but generally we were all in good spirits and ready to start the new day. 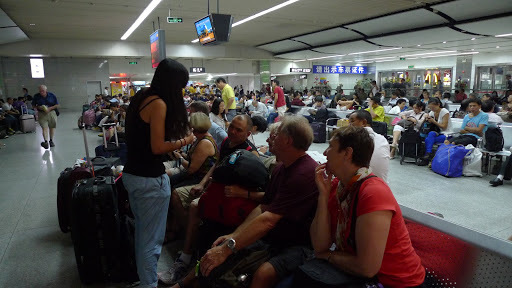 Disembarking in Guilin, we made our way by private minibus to Yangshuo. 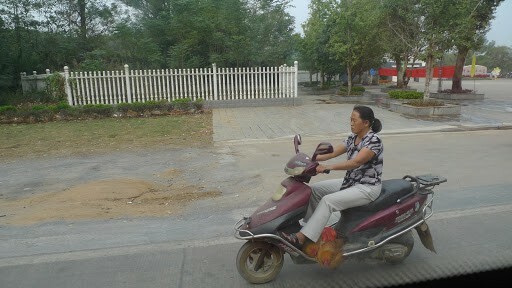 We were fascinated by the emerging countryside along the journey. Those limestone mountains are just like we see in Chinese paintings. Very beautiful. The traffic of course was crazy crazy crazy and just because there’s a white line down the middle of the road doesn’t mean drivers would ever stay on their side. 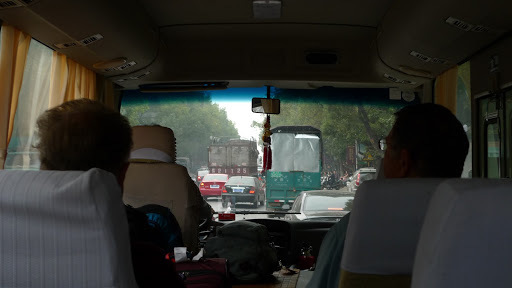 We were just beginning to see how traffic in China works. 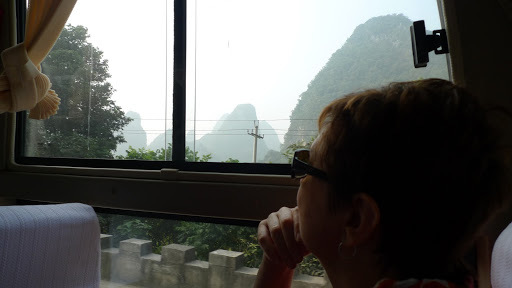 We arrived safely at our hotel, and I’ll post more about the very beautiful Yangshuo very soon.